Sentry™ Tennis Post System | First Team Inc.
First Team introduces the Sentry tennis post system. The Sentry tennis post line is extremely durable and versatile, capable of meeting the needs of dedicated and multi-purpose courts. The Sentry post is manufactured from 3.5" OD heavy duty, 1/4" thick high tensile aluminum. Straight and true, the Sentry will stand up to high use courts and allows proper game tension on the net with no bowing on the posts. The worm gear net tensioner winch is safe, no chance of injury due to back drive common on competitor's winches. 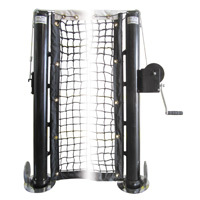 A heavy duty double top six net with coated top cable is included with each Sentry package. Center strap and anchor also included. 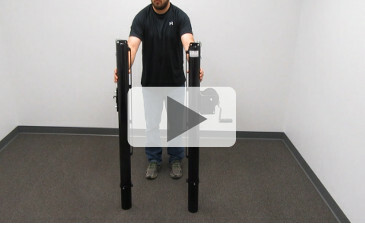 Each Sentry package includes ground sleeves for easy installation and post removal. 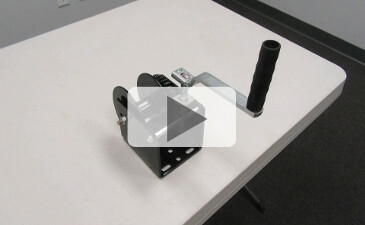 Sentry TNPS includes standard PVC sleeves, while Sentry TNSO includes our exclusive hinged sockets. These sockets are particularly useful on multipurpose courts where a smooth flush surface is desired when tennis posts are removed. Sentry TNSO also includes our exclusive Flush Mount strap anchor for flush surface when not in use.